If you were to ask Chicago-based guitarist Dave Specter why his albums are so diverse, he will reply simply: "I'm just trying to stretch out from playing shuffles and slow blues all night long." In the 17 years that Specter has been a Delmark recording artist, we've witnessed him go from one trick bag to another: he's recorded blues instrumentals with a Freddie King feel, and jazz instrumentals that extend the tradition of Kenny Burrell. 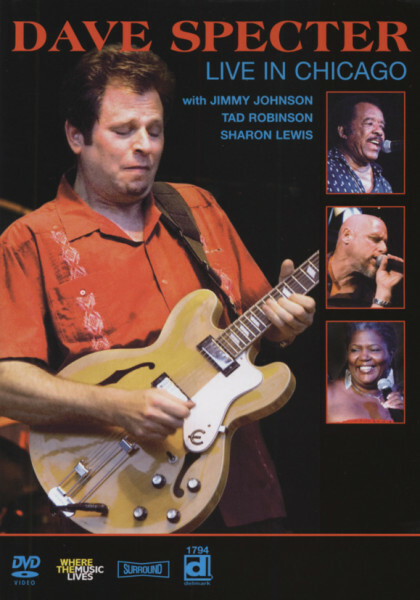 He has collaborated with guitarists Steve Freund, Lurie Bell, Floyd McDaniel and Ronnie Earl, subtly chorded behind noted blues vocalizers like Lenny Lynn, Tad Robinson, Jesse Fortune, Lynwood Slim and Barkin' Bill Smith. He's flirted with soul and funk, and if he has to go back to shuffles and slow blues, he can do that as well, with mighty conviction and originality. This new album finds him once again at work in front of a live audience. Rather than jet to the other side of the world (as he did on 1994's Live In Europe), he recorded this one right here at home in Chicago at two noted blues clubs, Rosa's Lounge and Buddy Guy's Legends. Rosa's is small and intimate; Buddy Guy's is significantly larger. Yet Specter & Co. put out the same commitment level for both venues. Live In Chicago finds Specter tilting towards soul and bluesified funk, two genres he's nodded to in passing on earlier records (he covered the Meters' "Look-Ka-Py-Py" on Speculatin', Delmark 744 and Otis Clay's "I Die a Little Each Day" on Live in Europe, Delmark 677). Rather than go for a full-on funk effect a la the Dap-Kings or other contemporary bands, Specter laces his backbeats with a blues inflection, like Junior Wells or Albert Collins. "We've been friends for many years," Specter says of Sharon Lewis, who got her start at Chicago's famed juke joint, Lee's Unleaded Blues. "We've done shows sporadically including a two-week tour of Europe in spring '07. I think Sharon is one of the best female blues singers on the scene." There's also a few jolting vocal turns and stinging guitar from Jimmy Johnson. "I met Jimmy probably in '84," Specter now reflects. "I was looking to break into the scene and I asked him for some guitar lessons. He introduced me to Steve Freund who took me under his wing. (Johnson) was playing a lot of keyboards back in the mid-80s, and hired me to play guitar. He's one of the truly original voices in the blues." And bringing the tale full circle, Johnson makes his first appearance on a Specter album. Two musicians Specter worked with on his last album, Is What It Is (Delmark 779) reappear on this album: drummer Marty Binder (who also played with Junior Wells and Albert Collins) as well as bassist Harlan Terson, a veteran of Otis Rush and Lonnie Brooks' bands. Joining the fray is keyboardist Brother John Kattke (formerly with Otis Rush and Buddy Guy), whose own band can be seen in Chicago regularly, hosting the jam sessions at Buddy Guy's Legends on alternate Mondays. While this album has the vibe you'd expect from a live record, the energy isn't sloppy or self-indulgent. With many blues bands, an instrumental is like a throwaway meant to mark time while the vocalist takes a gin break. Specter doesn't sing, but his instrumentals feel like genuine and thoughtful songs, not just random filler. On the lyrical side, Robinson has always been a solid storyteller and a gripping singer; two of his best tales are on this album, "What Love Did To Me" and "What's Your Angle?". Lewis weighs in with some viewpoints of her own on her two originals "In Too Deep" and "Angel". In Specter's universe, T-Bone Walker is one of the most underrated jazz cats ever while Jimmy McGriff may as well be a blues prophet. You can hear more of this blues-jazz continuum (with a touch of old-style funk) on Live in Chicago. It's not a case of "you had to be there," it's more like "you wish you were." James Porter, February 2008 James Porter is a Chicago-based music writer who has glorified scratchy blues 45's, greasy cheeseburgers, lost rockabilly classics, defunct TV shows and other ephemera for Time Out Chicago, Blues Revue, Roctober, the Chicago Reader and other magazines. Kundenbewertungen für "Live In Chicago"